NASHVILLE (April 7, 2016) — Nashville singer Brian Langlinais will be previewing songs from his forthcoming CD, Right-Hand Road, in a series of full band shows in Nashville and Franklin, Tennessee, prior to a nationwide and European tour when the album is released in September (Patoutville Records). Full band preview shows are set for The Country in Nashville on April 20, May 11 and June 15 (all at 9:30), and on June 3 at Grays on Main in Franklin (9:00 pm). Right-Hand Road marks a return to the source for this Louisiana-born master of Roadhouse Soul. He recorded the album with Grammy™-winning co-producer and engineer Tony Daigle at Electric Comoland Studios in Lafayette, Louisiana. The album was produced by Langlinais and multiple Blues Music Award nominee D.L. (Dave) Duncan. It is Langlinais' first studio album since 2010's acclaimed Tonight I Might. The new CD features six new originals (co-written with Duncan) and four hand-picked covers from the vast canvas of American roots: blues, soul, and Americana. Right-Hand Road also brings together Langlinais’ two musical homes, Nashville and Lafayette: in addition to cutting eight of the ten tracks at Electro Comoland, two tracks were recorded in Nashville by Neal Cappellion at Dog House Studios. Along with Brian Langlinais’ vocals and guitarwork, the album also features (in Lafayette): Ron Eoff (bass), Patterson Barrett (keyboards, mandolin), Bryan Brignac (drums), and Charlene Howard (background vocals). And in Nashville: James Pennebaker (guitar, lapsteel), Steve Conn (organ, piano, accordion), Lynn Williams (drums, percussion), and Jonell Mosser (background vocals). Whether he’s on a festival stage, in a bar or in the studio, Langlinais’ vibrant singing puts flesh and blood on the lyrical and melodic bones of every number he performs. His voice rings with the truth of experience and an honesty of expression that few entertainers possess. Working with a variety of bands across the U.S. and Europe, Langlinais has developed a style that straddles the worlds of pop, country, rock and soul — with the accent on soul. His previous two solo albums — 2006’s Rock and Fire and 2010’s Tonight I Might — are signposts of his evolution as an artist. In recent years he’s also been part of the Austin, Texas, supergroup the Mystiqueros, a revolving collaborative of A-team musical titans led by songwriter-guitarist extraordinaire Walt Wilkins. Named a "Best New Americana Release of 2010"
"Brian Langlinais' mix of Gulf coast soulful rock and stroll, with some blues of course, and some gospel ... all come together with confident playing on his second CD, Tonight I Might ... excellent CD." "Brian Langlinaisis not only an excellent guitar player, he is also blessed with a beautiful, soulful voice which can alternate between the raw and the subdued. ... Produced by Walt Wilkins and Bill Small, the album sounds remarkably warm and clear. ... Tonight I Might is a brilliant collection that lovers of good roots music will appreciate." "Langlinais ... blends soul, gospel, country, turbo folk and a touch of rock. A noted guitarist and singer, Langlinais delivers an array of songs including the spiritual 'I Was a Burden,' the common-sense 'Don't Shoot the Snake in the Bottom of the Boat,' and the chugging 'Tennessee Hideaway.' Call it country soul and you're on the right track." "The music is so fresh and unique that someone [had] to come up with an equally unique handle for the sound. I'll have to add 'Roadhouse Soul' to the list of great sounds that I have encountered in a city that many still regard as a 'Country Music Town'." " ... rich, soulful voice and songs ranging from swamp rock to poignant and tender love songs." 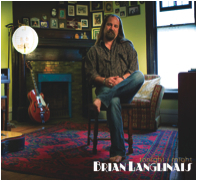 "The vibrant Brian Langlinais ... has released his sophomore album ... Danceable grooves and introspective lyrics are common threads woven through this project, as well as smooth and soulful vocals backed by top notch musicianship. ... his blues have redemption, and his vocals reveal an approachable spiritual lightness rather than dwell in bitter self-pity." "With Tonight I Might, an authentic musical masterpiece, Brian Langlinais has delivered a brilliant collection of love songs and roots music." "His second CD was worth the long wait. With his beautiful voice, Brian Langlinais again delivers twelve great, widely varied songs, from blues to soul, from Americana to honky-tonk. Tonight I Might is, in our opinion, one of the best we could listen to this year, becoming more and more penetrating with each spin." "Although distinctive singers are often in short supply, Brian Langlinais is a fresh voice that's worthy of notice. With an obvious ear for top shelf songs and a unique vocal approach, Brian Langlinais is a must hear." "Brian Langlinais can shake a room and make the spirits swirl with is voice and his very presence. A Cadillac of a singer, and cool picker to boot. He is the realest of deals, a deep cat, and an all-around general badass of a human. Lafayette, Memphis, Austin, West Coast, East Coast ... it's all in there, and he brings it out from his toes every time he sings. I'm proud he's my friend and in my tribe." "With the help of roots-rockers like Brian Langlinais, the American roadhouse as we know it will survive for at least a little while longer. On his new LP "Tonight I Might" ... Langlinais keeps it simple and swinging full of guitar boogie and soul. ... Langlinais's music, pure American roadhouse soul ... truly shines."